"Culebra Island" redirects here. For the island in the Falkland archipelago, see Sedge Island. 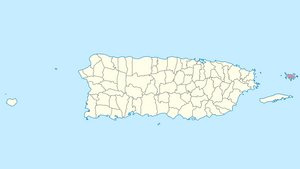 Isla Culebra (Spanish pronunciation: [kuˈleβɾa], "Snake Island") is an island-municipality of Puerto Rico. It is located approximately 17 miles (27 km) east of the Puerto Rican mainland, 12 miles (19 km) west of St. Thomas and 9 miles (14 km) north of Vieques. Culebra is spread over 5 wards and Culebra Pueblo (Dewey), the downtown area and the administrative center of the city. Residents of the island are known as Culebrenses. With a population of 1,818 as of the latest census, it is Puerto Rico's least populous municipality. Originally called Isla Pasaje and Isla de San Ildefonso, Culebra is also known as Isla Chiquita (“Little Island”) and Última Virgen (“Last Virgin”, due to its position at the end of the Virgin Islands archipelago). Some sources claim that Christopher Columbus was the first European to arrive at the island during his second voyage in 1493. It is believed that the island was populated by Carib Indians during the colonization. After Agüeybaná and Agüeybaná II led the Taíno rebellion of 1511, Taíno Indians from the main island sought refuge on Culebra and allied with Caribs to launch random attacks at the island estates. After that, the island was left abandoned for centuries. During the era of Spanish commerce through the Americas, it was used as a refuge for pirates, as well as local fishermen and sailors. Some sources mention an Englishman named Stevens, who was put in charge of Culebra in 1875 by the Spanish crown to protect the island from foreigners. Culebra was then settled by Cayetano Escudero Sanz on October 27, 1880. This first settlement was called San Ildefonso, to honor the Bishop of Toledo, San Ildefonso de la Culebra. Two years later, on September 25, 1882, construction of the Culebrita Lighthouse began. It was completed on February 25, 1886 which made it the oldest operating lighthouse in the Caribbean until 1975, when the U.S. Navy and Coast Guard finally closed the facility. M4A3E8 Sherman tank at Flamenco Beach. Culebra is an archipelago consisting of the main island and twenty-three smaller islands that lie off its coast. 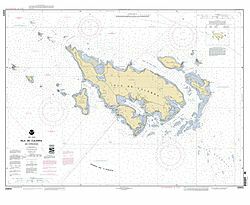 The largest of these cays are: Culebrita to the east, Cayo Norte to the northeast, and Cayo Luis Peña and Cayo Lobo to the west. The smaller islands include Cayo Ballena, Cayos Geniqui, Arrecife Culebrita, Las Hermanas, El Mono, Cayo Lobito, Cayo Botijuela, Alcarraza, Los Gemelos, and Piedra Steven. Islands in the archipelago are arid, meaning they have no rivers or streams. All of the fresh water is brought from Puerto Rico via Vieques. 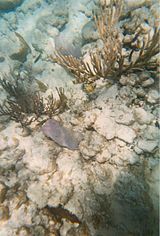 Culebra is characterized by an irregular topography resulting in a long intricate shoreline. The island is approximately 7 by 5 miles (11 by 8 km). The coast is marked by cliffs, sandy coral beaches and mangrove forests. Inland, the tallest point on the island is Mount Resaca, with an elevation of 650 feet (198.1 metres), followed by Balcón Hill, with an elevation of 541 feet (164.9 metres). Ensenada Honda is the largest harbor on the island and is considered to be the most hurricane secure harbor in the Caribbean. There are also several lagoons on the island, like Corcho, Flamenco, and Zoní. Culebrita Island also has a lagoon called Molino. Almost 80% of the island's area is volcanic rock from the Cretaceous period. It is mostly used for livestock pasture, as well as some minor agriculture. These small islands are all classified as nature reserves and several nature reserves also exist on the main island. One of the oldest bird sanctuaries in United States territory was established in Culebra on February 27, 1909 by President Teddy Roosevelt. The Culebra Island Giant Anole (Anolis roosevelti, Xiphosurus roosevelti (according to ITIS)) is an extremely rare or possibly extinct lizard of the Anolis genus. It is native to Culebra Island and was named in honor of Theodore Roosevelt, Jr., who was the governor of Puerto Rico at that time. There are bird sanctuaries on many of the islands as well as turtle nesting sites on Culebra. Leatherback, green sea and hawksbill sea turtles use the beaches for nesting. The archipelagos bird sanctuaries are home to brown boobies, laughing gulls, sooty terns, bridled terns and noddy terns. An estimated 50,000 sea birds find their way back to the sanctuaries every year. These nature reserves comprise 1,568 acres (6.35 km2) of the archipelago's 7,000 acres (28 km2). These nature reserves are protected by the United States Fish and Wildlife Service. Culebra has no natural large mammals. However, a population of White-tailed deer introduced in 1966 can be found on the eastern region of the island. Culebra is a popular weekend tourist destination for Mainland Puerto Ricans, Americans and residents of Vieques. Because of the "arid" nature of the island there is no run-off from rivers or streams resulting in very clear waters around the archipelago. Culebra has many beautiful beaches including Flamenco Beach (Playa Flamenco), rated third best beach in the world for 2014 by tripadvisor. It can be reached by shuttle buses from the ferry. The beach extends for a mile of white coral sand and is framed beautifully by arid tree-covered hills. The beach is also protected by the Department of Natural and Environmental Resources as a Marine Wildlife Reserve. The area west of Flamenco Beach and the adjacent Flamenco Point were used for joint-United States Navy/Marine Corps military exercises until 1975. Many military relics, including tanks, remain in the area. Culebra and Vieques offered the U.S. military an experience of great value to the battles in the Pacific as a feasible training area for the Fleet Marine Force in amphibious exercises for beach landings and naval gunfire support testing. Culebra and Vieques were the two components of the Atlantic Fleet Weapons Range Inner Range. In recent years, only the shortened term "Inner Range" was used. Early 20th Century warehouse, now converted into a museum. Flamenco Beach Ranked # 2 in the top 10 most exotic beaches in the world. In 1894, written reports indicated that there were 519 residents living in five communities: San Ildefonso, Flamenco, San Isidero, Playa Sardinas I y II, and Frayle. There were 84 houses built, 24 of them in the San Ildefonso community. The Culebra flag consists of five vertical stripes, three alternate yellow and two green ones. The yellow central stripe has the map of Culebra in green. The field is tierced in three, in the Spanish manner, vert, argent, or. The cross and the episcopal crozier symbolize Bishop San Ildefonso, because originally the island was called San Ildefonso de la Culebra. The crowned serpent (culebra means serpent) ondoyant in pale is the emblem of its name. The mailed arm refers to the coat of the Escudero family, first settlers of the island. The laurel cross refers to the civic triumph reached when Culebra obtained the evacuation of the United States Navy. The crest is a coronet bearing two masts, their sails filled by the wind. The island of Culebra can be reached through private boats, ferry, or airplane. Ferry service is available from Fajardo. Ferries make several trips a day to the main island for an approximate fare of $4.50 (round trip). Air Culebra from San Juan's Luis Muñoz Marín and Isla Grande Airports. Air Flamenco provides service from Fernando Luis Ribas Dominicci Airport in Isla Grande, Luis Muñoz Marín International Airport in San Juan, and José Aponte de la Torre Airport in Ceiba. Vieques Air Link provides service to Culebra from San Juan and Fajardo. M&N Aviation from Fernando Luis Ribas Dominicci Airport in Isla Grande, and José Aponte de la Torre Airport in Ceiba. There is public transportation available in the island, through public cars and taxis. The Navy–Culebra protests is the name given by American media to a series of protests starting in 1971 on the island of Culebra, Puerto Rico against the United States Navy use of the island. The protests led to the U.S. Navy abandoning of its facilities on Culebra. The protests consisted of a series of protests starting in 1971 on the island of Culebra, Puerto Rico, against the United States Navy's use of the island. The historical backdrop was that in 1902, three years after the U.S. invasion of Puerto Rico, Culebra was integrated as a part of Vieques. But on June 26, 1903, US President Theodore Roosevelt established the Culebra Naval Reservation in Culebra, and in 1939, the U.S. Navy began to use the Culebra Archipelago as a gunnery and bombing practice site. In 1971 the people of Culebra began the protests for the removal of the U.S. Navy from Culebra. The protests were led by Ruben Berrios, President of the Puerto Rican Independence Party (PIP), a well-regarded attorney in international rights, President-Honorary of the Socialist International, and Law professor at the University of Puerto Rico. Berrios and other protesters squatted in Culebra for a few days. Some of them, including Berrios, were arrested and imprisoned for civil disobedience. The official charge was trespassing on U.S. military territory. 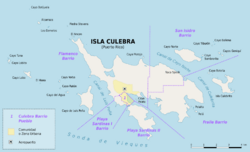 The protests led to the U.S. Navy discontinuing the use of Culebra as a gunnery range in 1975 and all of its operations were moved to Vieques. The case against the Navy was led by Washington lawyer Richard Copaken as retained pro-bono by the people of Culebra island. The cleaning process of the island has been slow. At the end of 2016, the United States Army Corps of Engineers sent letters to the residents of Culebra citing active removal of undetonated explosive material still present on the island. Two British sailing ships, the brig HMS Triton and the merchantman Topaz, are wrecked by a hurricane and come to rest with their crews on Isla Culebra in the novel Governor Ramage R.N. by Dudley Pope. Culebra, Puerto Rico Facts for Kids. Kiddle Encyclopedia.